On July 26, 2002, Under Secretary of Defense for Acquisition, Technology and Logistics Edward C. "Pete" Aldridge, Jr., signed a memorandum directing the U.S. Army to take prudent and deliberate actions to bring about an orderly termination of the Crusader program. In the memo, the Army was directed to ensure that current technology development continues either as part of an indirect fire technology demonstration or as part of other transformational programs. On the same day, Secretary Aldridge provided Congress with the Army's Indirect Fires Report and a reprogramming request to transfer $32 million from Crusader to new variants of the Future Combat Systems (FCS). Congress has approved the reprogramming request. Crusader is a full spectrum, standoff precision attack system that transforms land power on the 21st century network-centric battlefield. The self-propelled 155-mm howitzer (SPH) is supported by tracked and wheeled resupply vehicles. Two Crusader vehicles will be strategically deployable by C-17 aircraft to participate in the full spectrum of Army missions. Crusader carries key technologies critical to the next family of ground combat vehicles that will meet the Army transition initiatives. Crusader gives the field artillery corps lightweight robotics, new composites, drive by wire capability, a crew cockpit, embedded training, and diagnostic and prognostic software for the first time in one system. During Operation Desert Storm turbine-engine powered M-1 Abrams tanks that could move up to 50 miles per hour were moving outside the support fans of diesel-powered M-109 artillery batteries that could displace at only 25 to 30 miles per hour. Commanders responded by leapfrogging artillery battalions and supply elements, a solution which cut down on fire support, since only half the pieces could fire while the other half raced forward. Based on this experience, following the Gulf War development of the turbine-engined Crusader became one of the Army's highest priorities. Analyses shows that Crusader will increase the effectiveness of the total force (loss exchange ratio - enemy loss/friendly loss) by 24 - 53%, while reducing casualties by about one-third and logistics requirements for fire support by 15-25%. Crusader displaces the M109A6, Paladin, SPH (an upgraded 40-year-old howitzer) and M992, Field Artillery Ammunition Supply Vehicle. In 1996, the Army reduced the force structure from battalions of 24 guns each to battalions of 18 guns. This decision was made to reduce cost with the expectation that Crusader would be fielded to sufficiently offset the loss in force structure. United Defense, Limited Partnership (UDLP) (Minneapolis, MN) is the prime contractor. General Dynamics Land Systems (Muskegon, MI and Sterling Heights, MI) and General Dynamics Armament Systems (Burlington, VT) are major subcontractors for mobility and resupply. Honeywell, Raytheon, and General Dynamics are the major software subcontractors. 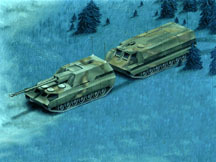 Crusader was modified to better support the Army transformation and objective force. The Crusader system was redesigned to increase its deployability while retaining all of its Key Performance Parameters (range, rate-of-fire, mobility, and resupply). Key features of the re-designed Crusader are lower weight (less than 40 tons), smaller size (2 howitzers transport-able in the C-5B or C-17), and a change in resupply vehicle philosophy (50% of resupply ve-hicles are tracked and 50% are now wheeled vice all tracked). Crusader will be air, sea, and rail transportable. Crusader's improved capabilities could be used in contingency operations to reduce the number of sorties required to deploy the Divi-sion Ready Force Artillery from eight to five C-5 and 12 to seven C-17 aircraft, over 40%, for equal cannon fire support or to provide three times the capability with the same lift. By early 2002 the Army had spent $2 billion on the Crusader to date. It would take another $9 billion to complete the program. Critics maintain the Crusader is too big and heavy for the lighter, more mobile Army of the future. As defense officials worked through the fiscal 2004 Defense Planning Guidance process, some alternative technologies came to light. There were some Crusader-like technologies that evidently showed a lot of promise. It became apparent to DoD officials that proceeding with the Crusader could delay or prevent funding promising technologies that could benefit all services. Deputy Defense Secretary Paul Wolfowitz asked Army Secretary Thomas White to come back within 30 days with a plan that assumes the Crusader is canceled and invests the freed $9 billion in other, more transformational, technologies. On 03 May 2002 Army Secretary Thomas White asked the Army inspector general to look into possible inappropriate behavior by service officials in connection with the Crusader artillery system program. The Fiscal Year 2001 Army budget request included decisions to restructure or "divest" a number of programs in order to provide some of the resources to support its transformation to achieve the ambitious deployment goals outlined in the October 1999 Army Vision. The restructured programs are the Crusader and the Future Scout and Cavalry System. The "divestitures" include Heliborne Prophet (Air), MLRS Smart Tactical Rocket (MSTAR), Stinger Block II, Command and Control Vehicle (C2V), Grizzly, Wolverine, and the Army Tactical Missile System Block IIA. Funding for these programs was reallocated to fund the Army Vision transformation strategy. The Army restructured the Crusader program to gain improvement in indirect fire support capability and reducing the overall weight of the system while maintaining all key performance parameters (lethality and mobility). The decision to restructure the Crusader was based on affordability and its compatibility with the Army Vision. By restructuring Crusader the Army saved $11.2 billion between FY00 and FY14. The restructure strategy includes partially satisfying the Army howitzer requirement by continuing to use Paladin and LW155 howitzer platforms, reducing the number of Crusaders from 1,138 to 480, and reducing system weight to 40 tons or less to equip III Corps divisions. The Crusader will be fully digital, fully automatic. The rate of fire will increase from the current four rounds per minute to 10 to 12 per minute. With this rate of fire, a single howitzer will be able to deliver at least four and up to eight rounds on a target that impact nearly simultaneously -- something which takes a platoon to do now. The Crusader will be faster than the Paladin. Its 1,500-horsepower diesel engine is expected to deliver a top road speed of about 42 mph -- enough to keep up with an M-1 Abrams-equipped maneuver force. The Crusader will change the way the field artillery fights. In the past, the crew's main focus was on the physical delivery of the fires. They load and fire the weapon. With the Crusader, timely, accurate fires are a given; the system takes care of that. The Crusader is also going to allow the crew to be more situationally aware. They're going to know exactly where they are on the battlefield. They're going to know where their sister howitzers are, where the resupply vehicles are, where the enemy is. That allows them to fight the system (the Crusader) and keep it alive on the battlefield. These new features will greatly increase artillery forces' lethality and versatility and will provide a significant increase in battlefield tempo. PM Crusader, with matrix support from TACOM-ARDEC, is also helping to develop a dedicated support vehicle which will provide ammunition, propellant, fuzes and fuel to the forces in the field. Both the self-propelled howitzer and the resupply vehicle will utilize state-of-the-art robotic handling systems which will decrease the time and number of personnel needed for resupply. In addition, these systems will be capable of maintaining speed and maneuverability with forces at the front lines of the battle. TACOM-ARDEC is involved in all aspects of Crusader's development, currently in the demonstration and validation phase, through fully integrated product development teams. The Crusader self-propelled howitzer will provide soldiers with a more lethal, capable, supportable, survivable, longer range, and less manpower-intensive field artillery system which will meet the user's needs well into the 21st century.